Some things don't need embellishing or interpreting. I would look more askance at this if it didn't fit in so well with so many of the other finds that we have enumerated on this blog. I'm just copying and pasting the text and photos as is and giving you the websites, so you can look at them yourselves. The WILLIAMS PETRADOX" or "The WILLIAMS ENIGMALITH"
The circumstances of my discovery: I found my Rock in a rural area, at least 25 feet from the nearest trail (which was dirt and faint), not near any urban areas, industrial complexes, electrical or electronic establishments, nuclear facilities, airports, or military operations (that I was aware of). The immediate ground was undisturbed. I was hiking in shorts. One of my instruments indicated on the other side of a pair of dense bushes. I rashly thought that the best way of reaching that area was to pass between the bushes. However, when I tried, the bushes began to painfully poke and scratch my legs. To get through, I vigorously shuffled my feet and stumbled out onto the other side. Once on the other side, I looked down at my ankles to inspect the damage, and then noticed my Rock a few inches from my heel. The only thing visible of the component was the tip of its three pins. I immediately recognized the pattern as being similar to that used in electrical connectors, and picked it up. It was definitely a Rock that I had just kicked up because it had a layer of moist loose dirt and some pliable root strands sticking out of it - evidence that it had been completely buried between or very near the bushes. I don't know how deep it was buried or the type of soil - perhaps as much as a couple of inches - or exactly where it had laid. The bushes were fairly large, and of a species that I believe lives for many decades. Once I cleared away the loose dirt and roots, I found that my Rock was encased in a hard layer of dried mud or clay. I later spent hours scraping, brushing, probing and washing away the mud/clay to get a clear view of my Rock and its component. For fear of ridicule and Government and skeptics harassment and possible persecution of my family and I to rip-off or destroy my Rock and discredit me, and also to give me the time to try to find some man-made explanation for it, I quietly and secretly held on to it for several years. Only last year, after I had exhausted my efforts to find a modern man-made duplicate of my Rock or its component, did I decide to get it professionally and objectively evaluated, and took the risks of exposing it to the public for that purpose. My Rock appears as in the photo images above. My Rock's material is solid natural quartz and feldspar granite (very little observed mica; I am not a Geologist) - not an accretion, concretion or pumice - does not contain any resins, cements, glues, limestone, mortar, or other non-granite binding agents - is very hard, is estimated to be at least 100,000 years old, and has embedded in it an electrical-like component (I assume to be a connector of some sort). 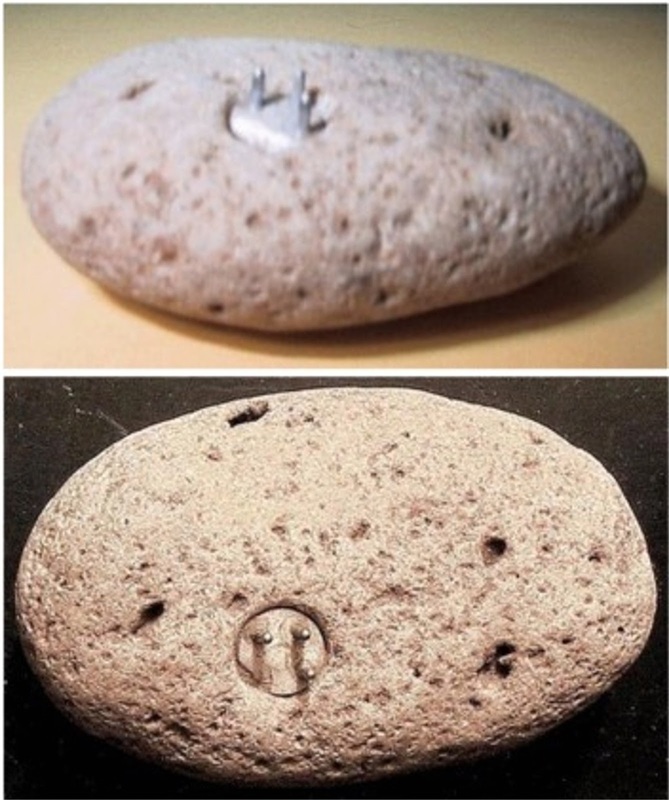 Within an error of about 0.2 mm for all dimensions, my Rock is 61 mm long, 38 mm wide (at its widest), and 22 mm high (excluding the pins/rods/prongs). It's embedded component's rods/pins/prongs ("pins") are made of some kind of electrically conductive material (I assume to be metal) and are of steel-like appearance. The component base/matrix ("base") is a whitish ceramic or rock-like material, and is definitely not a plastic, rubber, wood, or metal type material (relatively rare for most types of modern man-made electrical components, ceramic-based components are normally limited to high temperature, high radiation, high voltage, high power, and-or ultra-longterm uses). The component itself is 8 mm diameter; its pins are 3 mm high, spacing between the pins is 2.5 mm, and pin thickness is 1 mm. Rounding at the ends of the pins indicate some long-term wear, so 3 mm may not be their original lengths. All pins appear to be about the same size (wide-angle lens on digital camera distorts relative size of nearer objects to more distant ones). While there is no indication that there ever was a fourth pin or any type of keying, the Component's base is raggedly chipped where a fourth pin might have been located if there was one, and scoring on my Stone itself leading up to the chipped area indicates that at some time my Rock and its component received a forceful glancing blow. While the chipped side appears to be flat, it is not flat - the chip is deep. Ohmmeter readings (no matter what the connection polarity) indicate either open-circuit or very high impedance between the pins (FET-type or tube-type technology? Broken circuitry inside?). I have also injected various electronic signals through the pins without any response or reaction being detected. Some have speculated that the component is an XLR connector. I have done much research component searching on this, and it is NOT a XLR connector - or any other connector I know of. X-RAYS: Several people have suggested that I get my Rock x-rayed - say from a dentist or local lab. This is not as easy of a process as some make it out to be. Most would not even listen to me. Of the several that did listen, only a few would even consider it, and all of these insisted that I would have to leave my Rock in their possession and come back later to pick it up (yeah, sure!) - something I definitely will not do. There is no indication of any cement or glue whatsoever on or near the Component. Using an ammo reloading scale, my Rock weighs close to 2.5 ounces. There is slight magnetic attraction (using a 10-lb pull rare earth magnet), to the Component, and to the bottom of my Rock underneath the Component. Using a Spec-Tec Blacklight Unit (Model HD-1, Spectrum Technologies), "L" setting (longwave), there is some fluorescence along the rim of the Component. Neither my Rock nor its Component appears to glow in the dark, change colors, emit sound, light or radio wave, or feel unusually warm or cold, or have anything that rattles around inside of it (radiological properties are untested and unknown at this time). Some have speculated that my Rock is a thermal "rock" used with small animals, but extensive searching has not produced a single commercially made heat Rock that would verify this speculation, and no such match has ever been reported to me; and if it were a heat Rock, pin-to-pin resistances would be relatively low - not at or near open-circuit. My Rock is NOT a heat rock.